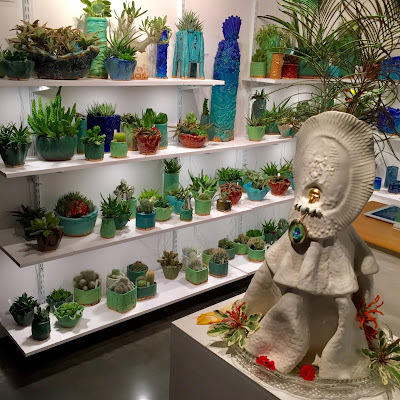 Ceramics as "Alive" as the Succulents & Cacti They Contain. 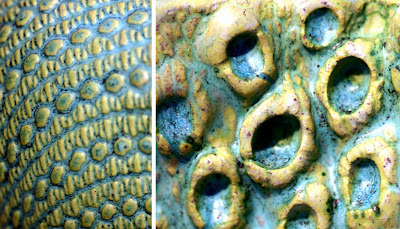 Pottery Pulsing with Pattern & Texture You Just Want to Touch. 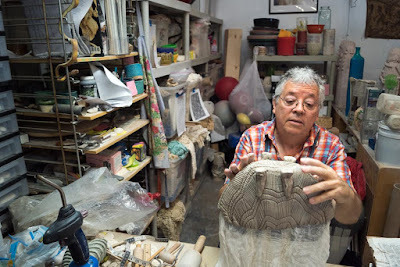 One of the greatest qualities of clay is the ease with which you can mold shapes and fire them to freeze form in time. Add inspired use of pattern and glaze on pots, bowls, planters & more and you've elevated what some consider a standard grade school project to beautiful ceramic art that you would gladly display around your home. 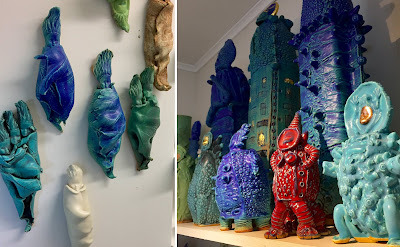 By mixing a strategic color scheme that is cool & calming with forms & texture pulsing with life, Rick Van Dyke has earned himself a spot among my favorite display-worthy potters. Admittedly, this artist's use of greens & blues first caught my attention since these are my favorite colors. Most of his pots & planters pop with these bright hues although in recent years he's added bold reds and even some gold leaf to his palette. 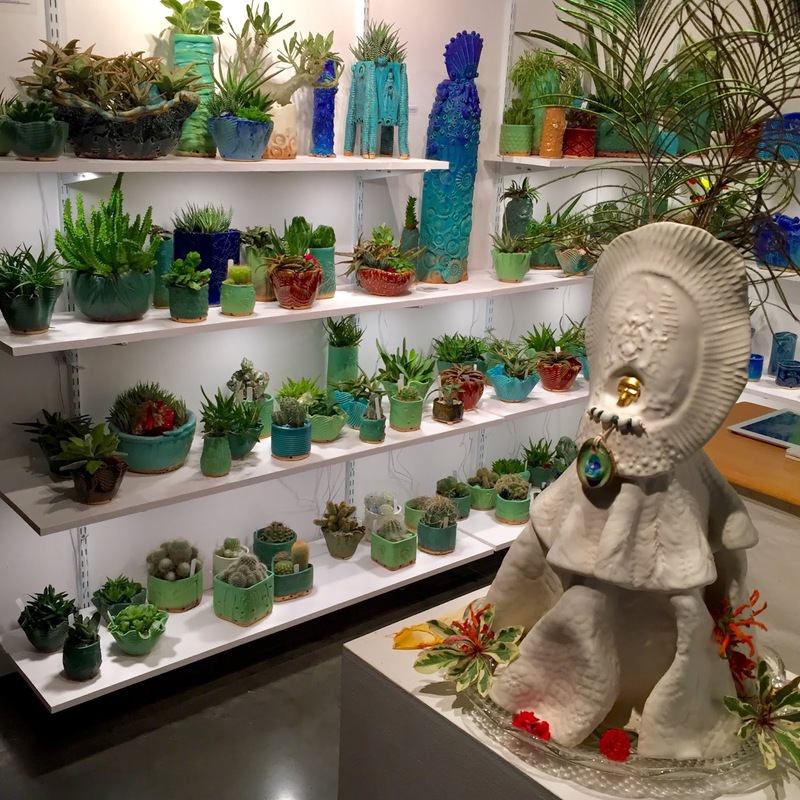 Personal opinion aside, the characteristic colors that this artist favors meld beautifully with the plants he uses to "decorate" his work. Plus, the way he adds texture to many of his pieces makes them as interesting to look at as to touch. I've been lucky enough to meet Rick and watch him at work. I really enjoyed learning his approach to creating such unique patterns. His secret is not limiting himself to traditional materials. Whenever he finds an unusual textile or patterned surface, he considers how it would look in clay. He is a perfect example of a full time artist who never stops gathering ideas and inspiration from anywhere. This dedication to his art clearly shows in his work, but also in his support of the art community through Fireseed Clay Art Studios, where he invites other ceramicists to work and collaborate.